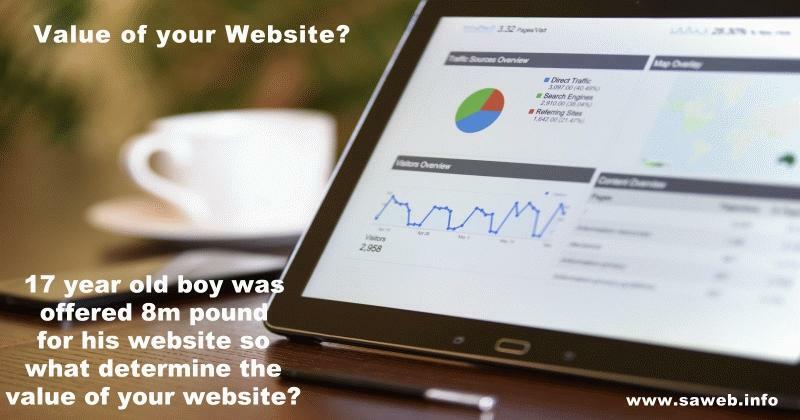 Years ago a 17 year old boy from the UK got an offer of 8 Million Pond for his website but he declined the offer and with website prices ranging from free to up in the ten and even hundred thousands the following question arise. What is the real value of your website? The first part is that there is very little relevance between the price you paid for a website and it's real value. The change is very good that the boy used a FREE or at least very low cost website while the real value of hundred thousands of websites that costed ten thousands of rands, are very likely less than their cost. I will answer the second part with a question. Magazines, news papers and many companies pay large sums for articles, news stories, research papers etc. and if you was the editor of a magazine or newspaper, how would you determine which articles or news stories is worth paying for? That is what the readers or visitors wants and is worth paying for and the number and quality of interesting and valuable content on a website determine the value thereof. The third part is interlinked with above and is a numbers game, the number of content as above, the number of visitors and the number of members or newsletter subscribers. At the age of 11 the boy started a teen website with content about teens and over time more and more teens from all over the world joined and contributed towards building the website with more content, up to the stage where the number and quality of content, members and visitors prompted such 8 million pond offer from a big company. Content is King, content is the currency of the internet. Once you understand that you can increase the value of your website day after day, month after month and year after year by adding good quality, fresh, interesting and valuable content about your business, products and industry on daily base. The world is large and people like to stay connected with whats going on so what makes your business newsworthy?